The construction of any residential building, industrial building, other type of building begins with the preparation of the foundation. 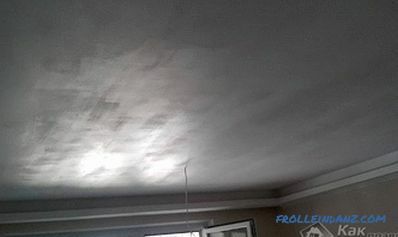 Proper calculation and installation of the base is a guarantee of long-term operation of the building without precipitation, the appearance of cracks in the walls, the emergence of other problems with the violation of geometry. In modern construction, various types and types of foundations are used, the choice of which depends on: the characteristics of the soils on which the house is built; the size of the building; used wall and construction materials; climatic conditions; groundwater level. These and other factors determine the choice of a design variant that is optimal for a particular house. The foundation must not only withstand the weight of the building, but also have a sufficient margin of safety to compensate for unforeseen loads, natural disasters (for example, floods, severe frosts causing soil swelling, etc.) and an increase in the weight of the building due to additional exterior and interior decoration, redevelopment, increase in height, snow on the roof. This type of foundation is most common in private construction. Although the strip foundation requires a certain amount of earthworks and a significant consumption of concrete, it is the most reliable solution for stone, brick, block, claydite-concrete and cinder-concrete houses. It maintains a significant weight of the walls, evenly distributing it around the perimeter and exerts uniform, but not excessive, pressure on the ground, due to the large area of ​​support. 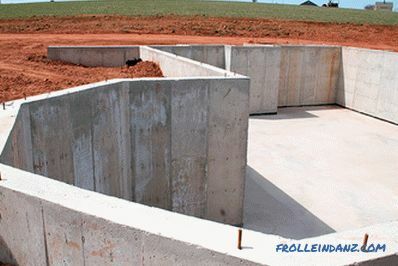 Structurally, the strip foundation is a monolithic reinforced concrete structure that runs along the entire perimeter of the house and under all load-bearing walls. Often, the concrete base is poured and under the partitions - this increases the construction cost, but significantly increases its reliability. Belt foundations allow you to equip the basements, ground floors, garages under the house - in this case, the foundation is deepened to the height of the underground room and its carrying capacity does not decrease at all. There are various types of strip foundations, which, according to the method of installation, can be divided into two large groups - monolithic and prefabricated. boards or special boards for formwork. The installation technology is quite simple - a trench is dug along the entire contour of the house (including internal walls and lintels) 0.4–0.8 m wide, depending on the thickness of the future walls. The width of the trench should be 10 - 15 cm wider than the calculated dimensions of the foundation. Expansion of the trench is necessary to enable the installation of formwork. After installation of the formwork, a reinforcing belt of reinforcement with a diameter of 10-18 mm is connected inside. During the construction of a two-story house, the rebar is installed both in the underground and above-ground parts of the foundation. Mixed directly at the site or ready (from the factory) concrete is poured into the formwork one day to the full height of the foundation. Thus, the necessary strength and water resistance of the base is achieved. Many private developers make a very dangerous mistake - in one working day they pour concrete into the trench, and in the second - into the upper part of the formwork. The seam that appeared at the site of contact greatly reduces the strength of the foundation and serves as a source of water erosion. Monolithic strip foundations are convenient in that they can have a rather complicated configuration, including curvilinear contours. 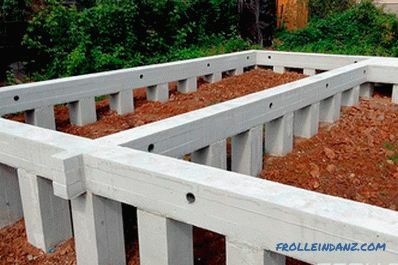 It is only important to set the formwork correctly and install a reliable arm-belt. Prefabricated foundations are assembled from prefabricated factory-made blocks. They are installed in the finished trench, bound with steel wire, and the seams are filled with cement mortar. For the installation of such a foundation is needed medium-capacity lifting equipment. 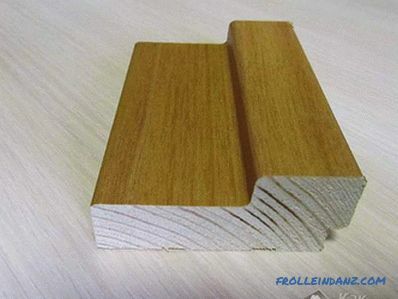 Prefabricated strip foundations are very strong and durable - the lifetime is more than 150 years. But in the application of blocks there is one limitation - of them it is convenient to mount the foundations only of rectangular configuration, which are multiples of the block length. Cutting a block is a complicated and expensive operation. Also prefabricated foundations are limited in depth. It is inexpedient to build basements and basements from blocks - sooner or later water will begin to seep through the seams. According to the depth of laying, the tape bases are subdivided into finely and fully buried. Shallow-depth foundations are preferable for single-storey brick and wooden houses on soils of all types. It is especially appropriate for high groundwater levels. It represents a concrete strip on a sand pad. Dredging into the ground does not exceed 50 cm (on soft soils - up to 70). Practice shows that with a properly prepared sand cushion with a height of at least 15 cm and an armopoyas set by all the rules, such a foundation copes well with its duties. To improve the reliability of the base, it is necessary to install a warmed blind area not less than 50 cm wide, which serves to drain rainwater and protect the soil around the perimeter of the house from freezing. Saving materials, compared with a fully recessed strip foundation. Construction is possible in areas with high groundwater levels. Very high quality reinforcement is needed. High probability of cracking in walls constructed of heavy materials. Drainage and sand pillow are required. 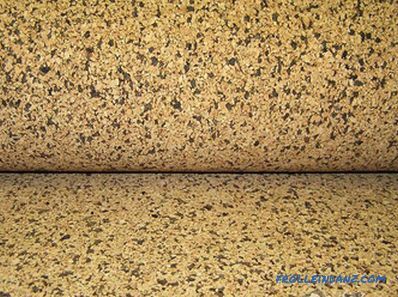 Full-depth ribbon foundation is used in the construction of houses of two or more floors, with massive walls and concrete floors. The depth of its installation is 20-30 cm below the depth of soil freezing in the climatic zone of construction. This is an extremely durable and reliable construction, almost not subject to temperature distortions and not afraid of rising groundwater. The reliability of the foundation increases the reinforcement, which is performed by tying the framework of corrugated reinforcement. Sometimes, submerged strip foundations are built without reinforcement, but this is appropriate only on dense and rocky soils. The cost of a fully submerged foundation is quite high - it requires a large amount of concrete and a significant amount of earthworks. The total cost of reinforcement will be no more than 5–8%, and reinforcement reinforces the foundation very noticeably, completely eliminating the likelihood of cracks and chips. It is not worth saving on armored belt even with a limited construction budget. Not subject to temperature distortions. 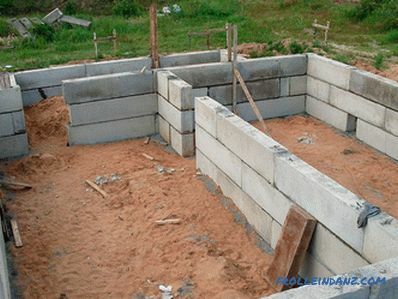 Suitable for the construction of houses with heavy walls. Allows you to equip the basement or basement under the house. It is difficult to build with high groundwater levels. House foundations in the form of solid or precast slabs for the entire area of ​​the building are less popular than strip foundations, but in some cases are the only possible option . When building on unstable, sandy-argillaceous, intruding soils, with a high occurrence of groundwater (above 1 m), deeply freezing soils, it is best to pour solid reinforced concrete slab on which buildings of any number of floors are erected. 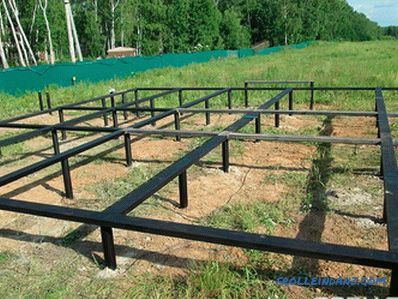 For frame single and two-story houses, slab foundation is almost the ideal solution. It is less complex than tape and pile, but compared with them more costly in terms of material consumption and the required amount of working time. Such foundations are often referred to as floating - they are constructed without penetration and affect almost only the surface of the soil. Temperature and other ground movements on the stability of the foundation, and, hence, the entire building, have practically no effect. 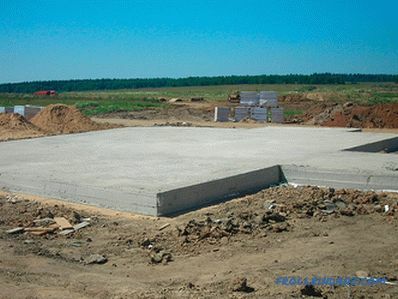 Plate types of foundations used in construction are divided into monolithic and prefabricated. The second option is often used in the construction of dimensional buildings with a large base area and a complex perimeter configuration. 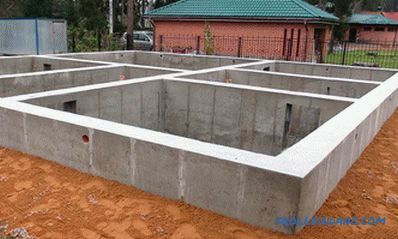 For a residential house, it is better to stay on a monolithic foundation of molded reinforced concrete. Simplicity of design and construction . Suitable for construction on strongly heaving, moving and subsiding soils. Does not require much penetration into the ground. Can be used with high groundwater levels. Can only be used on horizontal platforms or with a slope of no more than 1 meter for the entire length or width of the house. This type of foundation has spread along with the growing popularity of frame and panel cottages, as well as houses from glued and sawn timber. The cost of such a foundation is several times lower than that of a tape or slab. The main feature of this foundation is the need to install the bottom trim of a timber or beams, which serves as the foundation of the house. 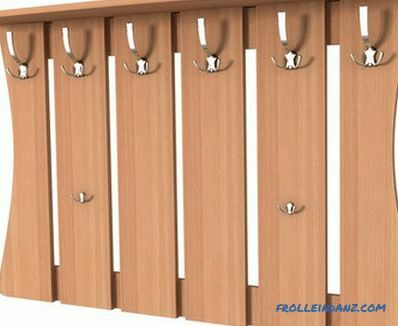 Poles are installed under all perimeter walls and internal partitions with an interval of up to 2.5 m (optimally 1.5 - 2 m). They are buried to the ground to a depth greater than the level of freezing and rise above the ground level to the required height. Such foundations are very convenient in areas of uneven terrain - by varying the height of the pillars it is easy to achieve a perfectly horizontal position of the harness. Sizes vary in the range of 38–50 cm on the side, as a rule, they represent a square in cross-section, and more rarely a rectangle. According to the method of construction, columnar foundations are divided into monolithic and prefabricated. The choice of option is determined by the properties of the soil on the site where the house is being built. With the deep occurrence of groundwater, the monolithic columnar foundation of reinforced concrete is an ideal choice. As in the strip foundation, the reinforcement cage in the column is obligatory in any climatic conditions. 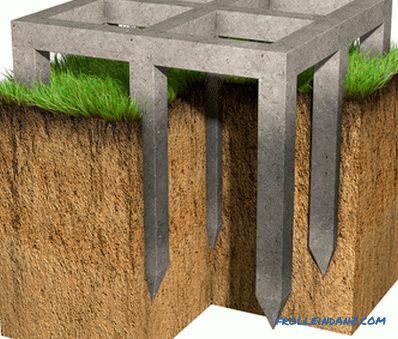 A gap between the column and the edge of the well (the distance should be at least 10 cm) is filled with fine gravel or sand - thus reducing the load on the foundation from the ground during freezing or other movements. But on soils with the risk of horizontal movements (quicksand and other unstable soils) it is not recommended to install columnar foundations - they have a low resistance to overturning and there is always a risk of impaired stability at home. Precast column foundations are pillars and concrete platforms manufactured at the factory. They are assembled in the form of a designer at the site and are interconnected by welding reinforcement and concreting joints. With all the cheapness and ease of installation, columnar foundations are quite limited in scope. 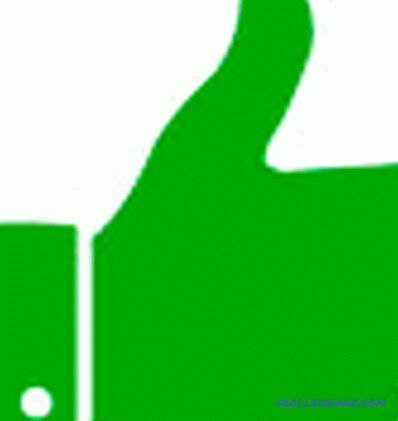 They are justified on durable and stable soils for buildings no higher than 2 floors, without basements and socles. But "narrow specialization" does not reduce their attractiveness for private construction. Weak stability in horizontally mobile grounds. The need for a basement arrangement. Cannot be used for buildings with heavy walls. The most popular foundations in industrial and high-rise residential construction. 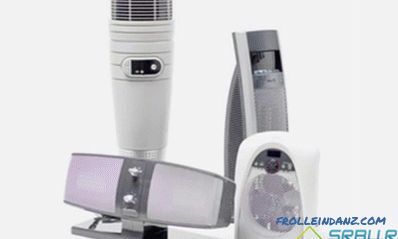 Often used in the construction of small private houses and cottages on modern technologies. If during the construction of an industrial way, houses of any materials are built on pile foundations, then in the private sector mostly light constructions of CIP panels, timber, logs are on the piles. 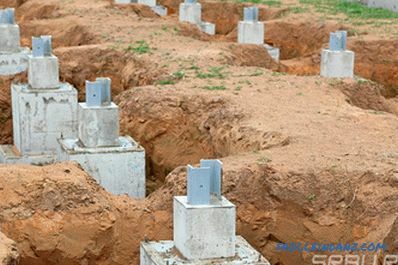 Different types of pile foundations allow you to choose suitable for any type of structure, practically on any soil. Piles are very convenient for construction in areas of complex terrain, including on unstable soils. The fact is that the length of the piles is practically not limited - they can reach a depth of 50 meters or more, which makes it possible to guarantee the achievement of stable layers of soil on which a building of any size and weight can lean. Modern construction technologies use three main types of piles: screw, bore and bored. 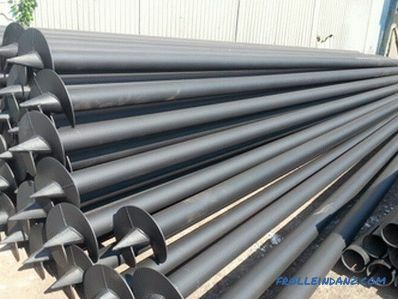 The most popular screw piles in low-rise construction are ordinary metal thick-walled pipes with a screw at the bottom. They are screwed into the ground like ordinary screws; this is done manually or with the help of special machines. The length of the piles can reach 10 -12 m with a diameter of 50 - 150 mm. After screwing in such supports, they are cut off at a predetermined height and connected by horizontal beams - a grillage acting as the foundation of the house on which the harness is laid, floor is laid and then walls are erected. 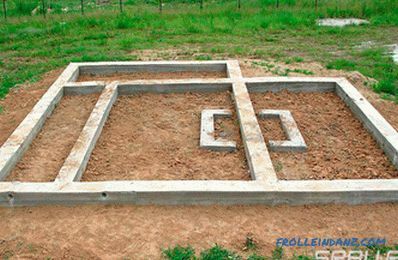 Low cost of the finished foundation. Failure (metal in the ground is susceptible to corrosion). 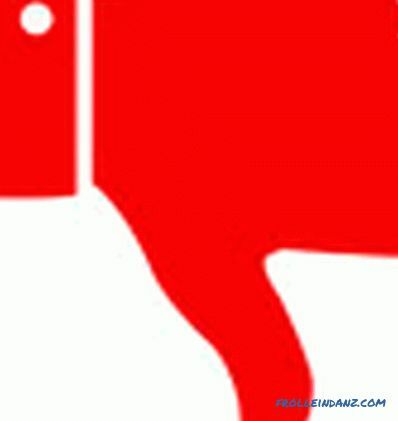 The need for screwing to a greater depth. 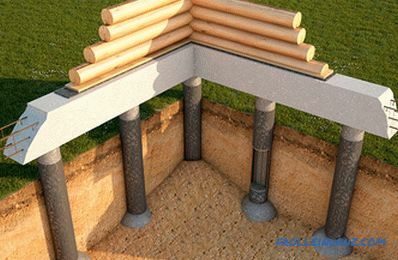 Bored piles are mounted using a different technology - first, a well is drilled in which the reinforcement cage is mounted. Then the whole structure is poured with concrete. Speakers above the ground cut off at a given height and are connected by a grillage. The depth of such piles can reach 50 meters. Possibility of building multi-storey buildings on any type of soil — piles are submerged to the required depth, to dense layers capable of supporting the weight of the building. Uniform distribution of the load on the base. Adjusting the weight acting on one pile by changing the number of supports. The complexity of the calculations and installation. The need for costly geological surveys. The need to use heavy lifting and drilling equipment. Drop-in piles are concrete products in the form of beams of square or circular cross section of great length - 12 or more meters. They are hammered into the ground with percussion devices or a vibration immersion method. They are used mainly in industrial construction - complicated and expensive equipment is required for driving. Having considered all the main types of foundation for a private house, the choice of the optimal variant is simplified. For brick, block and stone buildings optimal strip foundation. 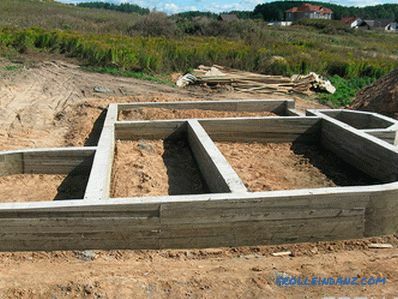 For frame construction, timber houses and logs are more suitable slab or pile (screw), on solid ground - columnar. But in each individual case, one chooses one’s own option, as long as the foundation fulfills its main function — serves as a reliable support for the house.